You asked for it and here it is. I had to get some help for this post. My sewing friend, Emily, had all these presser feet for her sewing machine. So I went over to her house and she told me what each one was used for. See. I’m learning along with you. These were the 11 various types of presser foot she had. 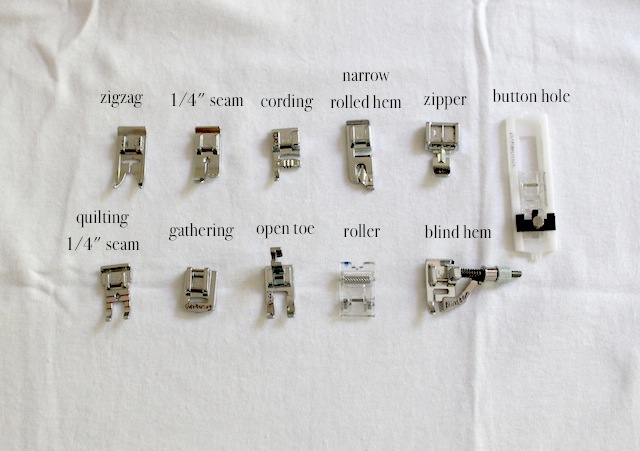 Make sure you purchase the correct presser foot for your brand of sewing machine for it to fit correctly. Zigzag foot. This is the standard foot that comes with most machines. It works with zig zag stitches and straight stitches. 1/4 inch seam foot. Follow the edge for 1/4 inch straight stitches. It may also have 1/8 inch marks on it. Cording foot. Mostly for decorative purposes with a thin cording that is sew on top of fabric. This foot guides the cords and does a zigzag stitch over the cord. Up to 3 cords. Narrow rolled hem foot. Very thing hemming. The foot rolls the fabric as it does a single straight stitch over the roll. The hem is only about 1/8 inch wide. Use it on anything where you don’t want a bulky hem such a table cloths and some skirts. Zipper foot. Used to stitch close to zippers or piping. The needle could go on the right or left side and the same side as the zipper or piping. Button hole foot. Used to make button holes the exact size of the button. You would take your button, use it to measure the hole size then use the button hole setting on your machine. See your manual for detailed instructions. Quilting 1/4″ seam foot. It has horizontal measurements to help make precise corners or squares. Quilters use this often when sewing squares. It is used similarly to the cornering guides on your needle plate. Gathering foot. Used to make exact gathers with the fabric. This is different from doing it using basting stitches because with the basting stitch, you can adjust the gathers and move them. This way it makes even gathers everywhere that’s sewn. Open toe foot. Use when you are making precise stitches and need to see where the needle is going. It also has a groove at the bottom of the foot that helps with appliqué. Roller foot. To be used with “sticky” fabric such as leather or suede. Or fabric that may get caught by the regular presser foots such as batting. The roller helps the fabric move along under the foot. Blind hem foot. It adjusts to the size of the hem you want and you will need to fold the fabric differently. See your manual for instructions on how to fold. You will also need to adjust to the right blind stitch setting on your sewing machine. When using this stitch, the front size of the hem only shows very little if any of the stitching that hold the hem together. Thanks for this. I have had my sewing machine for 10 years now and have never changed my foot. Ever. I keep wanting to make a pouch with a zipper, but I’m afraid to! you are right. and i knew that. i guess that’s what happens when i write posts at after midnight! 🙂 thanks for correcting me. I can’t remember if I have a foot for doing the blind hem stitch…will have to look into that! The blind hem stitch is a lifesaver for a shortie like me who is always having to hem pants. Thanks for the great overview of feet! Thanks for this. I only use a couple of different feet, so it is nice to know what other exist! question- in the zigzag foot, is the needle supposed to be in the middle when sewing a straight stitch? I bought a used sewing machine and the needle is all the way to the left when I sew a straight stitch- not sure if I’m supposed to adjust it. Thanks! your needle is supposed to be in the middle when doing a straight stitch. check your settings again. sometimes there is a setting for side straight stitch (for like doing zippers or something). It can depend on your sewing machine. Usually the needle is supposed to go in the centre for straight stitching, but one some machines (the Brother CS6000i for example) the needle is supposed to be to the left. The only way to check (unless you have the manual) is to measure from the needle to the markings on the needle plate and see if they match. There is an advantage to having the needle to the side: when the stitch is made there will be more of the stitch plate around the needle to support the fabric and prevent it from going into the needle hole. This is especially helpful when sewing lightweight fabrics or knits and it helps to prevent skipped stitches, I think. I find this very helpful. I’m attempting to sew a decorative pillow and I’m trying to look for the right presser foot to sew the cording around the edge. Do I use the cording foot for this purpose or is this foot just for top decorative purposes? Really helpful guide, I’d worked out the zig-zag foot and the zipper foot but I hadn’t had a clue about the buttonhole foot that came with my machine! I bought singer machine ,which type of presser foot do I have to use for overlok stiching? I used to teach beginner sewing, You should always press the deaset if bought from one to teach you about all the feet, It is so much fun to do projects and learn about something you haven’t done before, Great demo of the feet, Thanks! I have never owned (or used) a sewing machine in my 44 years of life. After deciding that there’s no time like the present–and almost chickening out again–I took the plunge and bought a used machine. It came with three boxes of feet. Thanks to you, I now know what at least a few of them are. Even if I don’t know how to use them :). this was awesome information. My daughter is a new to sewuing and we just bought her a new machine that came with various foots and i wasnt sure what they were for.